2/4mm Spring Buffalo "SILFLORETTES"! 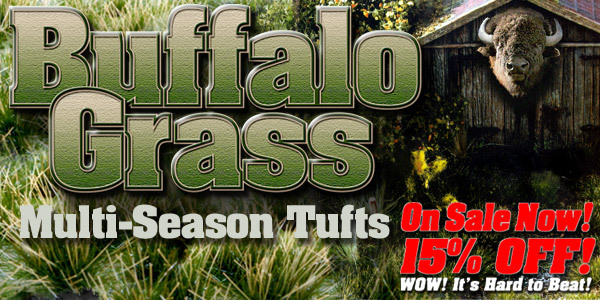 Our infamous Buffalo Grass is now available in smaller sampler-size packaging! Each "Silflorette" contains one sheet measuring 1-1/2" wide by12" long and contains nearly 75 to 100 2/4mm spring-tone buffalo grass tufts! 2/4mm Summer Buffalo Grass "SILFLORETTES"! Our infamous Buffalo Grass is now available in smaller sampler-size packaging! Each "Silflorette" contains one sheet measuring 1-1/2" wide by 12" long and contains nearly 75 to 100 2/4mm summer tone buffalo grass tufts! 2/4mm Late Summer Buffalo Grass SILFLORETTES! Each 'Silflorette' contains one sheet measuring 1-1/2" wide by 12" long and contains nearly 75 to 100 2/4mm length late summer-tone buffalo grass tufts! 2/4mm Autumn Buffalo Grass SILFLORETTES! Now available in smaller sampler-size packaging! Each Silflorette contains one sheet measuring 1-1/2" wide by12" long and contains nearly 75 to 100 2/4mm length autumn tone buffalo grass tufts! 4/6mm Spring Buffalo Grass "SILFLORETTES"! Our infamous Buffalo Grass is now available in smaller sampler-size packaging! Each "Silflorette" contains one sheet measuring 1-1/2" wide by12" long and contains nearly 75 to 100 4/6mm spring-tone buffalo grass tufts! 4/6mm Summer Buffalo Grass "SILFLORETTES"! Our infamous Buffalo Grass is now available in smaller sampler-size packaging! Each "Silflorette" contains one sheet measuring 1-1/2" wide by12" long and contains nearly 75 to 100 4/6mm summer tone buffalo grass tufts! 4/6 mm Late Summer Buffalo Grass "SILFLORETTES" - Each 'SILFLORETTE-size' package contains one sheet measuring 1-1/2" wide by12" long and contains nearly 75+ 4/6mm length late summer-tone buffalo grass tufts! 4/6mm Autumn Buffalo Grass 'SILFLORETTES'! Now available in smaller sampler-size packaging! Each SILFLORETTE contains one sheet measuring 1-1/2" wide by12" long and contains nearly 75 4/6mm length late summer-tone buffalo grass tufts!